Hoist The Sails in the Channel! Our meeting point is Hamble Point Marina. The marina is located between Southampton (7.5 miles / 12 km) and Portsmouth (18 miles / 29 km). It is easily accessible by train or by road. Check-in hour: Friday at 16h00. It would be great if you could arrive to the marina before 16h00 to have enough time to provision the yacht together with your crew. Later arrivals are allowed if you don’t have another choice. Your crew will do the shopping for you, so be considerate and bring them a little thank-you present. Sweets from your home country work best ;). We will leave the marina on Saturday morning, after the breakfast, and after the safety briefing. Check-out hour: 12h00 on the last day of the trip (Friday). We will probably come back to the marina already on Thursday evening. We may go out to share a dinner and spend the last night on the boat talking long into the dark. 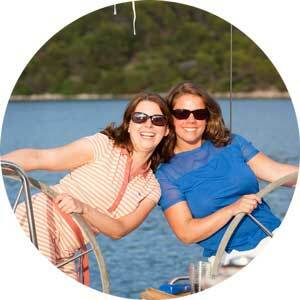 Included in every trip we organize is a basic sailing course. We follow the methodology of the Royal Yachting Association and we go with you through the Competent Crew course. For this sailing trip we assume that you have some sailing experience, so we will go more quickly through the basics (safety, mooring, anchoring, wind and sail trim) as a refresher, and focus more on tidal calculations, currents, passage planning, and recognising the lights at night. The course is absolutely free of charge and the purpose is that you understand how to participate in most of the sailing related activities, feel safe and comfortable on the yacht and catch a bit of passion for sailing. The skipper is there for you to offer guidance while you and the crew are there to sail the boat. It’s a hands on experience. 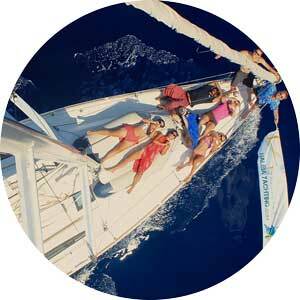 The sailing course serves also as a form of team building: providing easy goals for the crew to be achieved together. Course content (basics): knowledge of sea terms and parts of a boat, rigging and sails, sail handling, ropework, fire precautions and fighting, personal safety equipment, man overboard, emergency equipment, meteorology, seasickness, helmsmanship, general duties, manners and customs, rules of the road, standard manoeuvres, dinghies. Course content (advanced): Extra on this trip: tides and currents calculations, course to steer, charts and navigation, night sailing, lights and signals, watch keeping. Ability after the course: able to steer, handle sails and trim them to the wind, keep a lookout, avoid collisions, navigate, read charts, plan a daily passage, row a dinghy and assist in all the day to day routines. Example of manoeuvres which you should be able to perform with your crew: hoisting and putting down the sails, jibing, tacking, trimming the sails, man overboard. Example of manoeuvres where you will assist your skipper: anchoring, mooring at the buoy, mooring in the marina. Extra on this trip: able to keep a night watch, recognize vessels by their lights. This Channel Crossing trip will be an ideal preparation if you are thinking of passing your RYA Day Skipper or another national sailing qualification. From either Southampton or Portsmouth, take the train to the station ‘Hamble’. From the station, you can either walk (2 miles / 3km, 40 min) or take bus number 6 from Hamble Lane School to Copse Lane. From there, it’s another 1 miles / 1.5km (20 min) walk. Take the train to Southampton Parkway (airport). This is a 20 minute taxi ride from Hamble Point Marina. It is preferable to use Southampton Parkway rather than Hamble station due to the lack of taxis at the station in Hamble. The nearest airport is Southampton Airport, a 20 minute taxi ride from Hamble Point Marina. The postcode for your Sat Nav is SO31 4NB. Bear left as you enter the marina and park in the vicinity of the Ketch Rigger pub. The Channel Crossing is a more demanding sailing than the trips we usually propose. We therefore do not recommend it as a first sailing experience. We would advise that you have done let’s say a week of sailing before and feel reasonably comfortable on a boat. 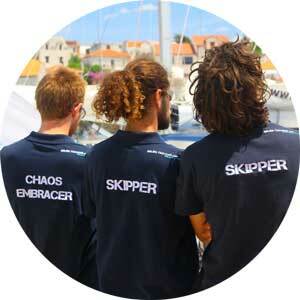 In any case we will make sure that the crew comprises a few more experienced sailors to act as watch leaders. HOW ROUGH WILL THE CONDITIONS BE AT SEA? The Channel Crossing is open sea. We will not leave if the forecast is any higher than Beaufort force 5, but even in F5 some 2-3m waves can make the trip pretty rough. On the other side, we may have no wind at all, and spend the whole night running the engine with the sea as flat as a mill pond. In any case, we wouldn’t recommend the trip if you are particularly sensitive to sea sickness. At Naleia we plan as we go according to the weather conditions and all crews’ moods. There are a variety of places that we can visit, but the order and exact choice is only made each morning after verifying the weather conditions, the tides and the currents. Join Us For Sailing Across The Channel!